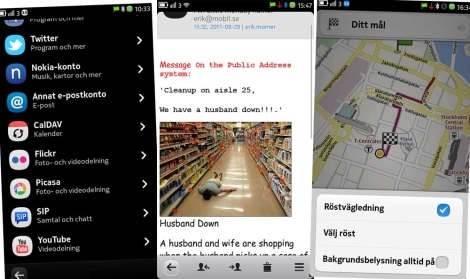 Here’s a three-part Nokia N9 review, in Swedish by the folks of mobile.se. Gives a goofy smile to the reviewers face on start up – N9 seems like a very eager puppy. Smile comes from the feeling of “here’s how it should work” after using N9. Drag and drop music or use Nokia link to talk to services such as iTunes. This btw works on a mac. This is interesting, flash on the N9 almost looks like xenon flash. Really? Nokia said they’ve improved the dual LED again over the excellent ones in the N86. Note the N8’s xenon is not really as bright as say the N82. I suppose F.2.2 also helps here.. Questions why Nokia went Windows Phone – would be a pity not to help make N9 succeed. That was just a quick skim over. Thanks to guest for the tip!